2015 Inaugural Grand Prize Seed Fund Winner eMobilis Kenya receiving the $5000 Grant (Click to Enlarge)In a #STEM4girls Pan-African campaign, the Miss.Africa program is mobilizing a Round II Seed Fund for Tech initiatives in Africa that will avail small grants to support women and girls in the Science, Technology, Engineering and Mathematics (STEM) fields to launch or expand their own initiatives that will increase digital opportunities in IT related training, jobs and leadership roles. "These STEM projects are important for the development and growth of internet technologies that will spur Africa to the next frontier and we are happy to be part of the progress of taking the continent to that global platform," says Sophia Bekele, CEO and Founder DotConnectAfrica Group. This is the second round of announcement for Miss.Africa Seed Fund. 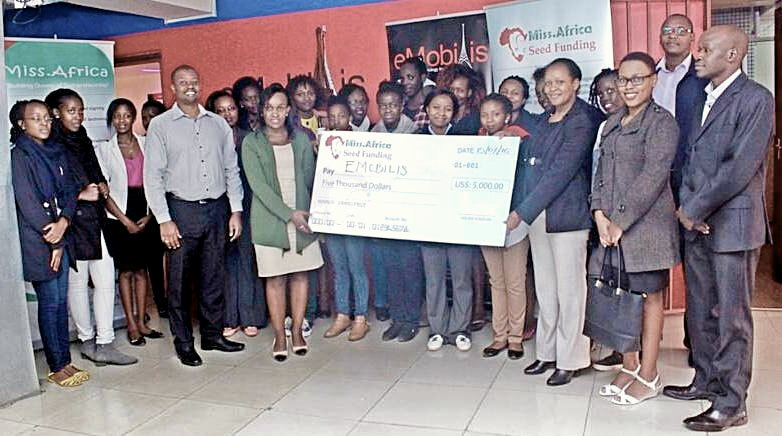 The winner of the first round eMobilis, is a Kenya based Mobile Technology Institute that focuses on training women and girls on Mobile Software Development and Network Infrastructure, which emerged as the grand prize winner of the inaugural Miss.Africa Seed Fund for an amount of USD 5,000. Twenty Five (25) women selected from over three hundred applicants will benefit directly by receiving training from eMobilis. The two other winners for the USD 1000.00 prize were a Madagascar based Tech start-up MDG/Pyladies Antananarivo and Pycon Cameroon, a start up that teaches computer coding to girls and women. Local Time: Thursday, April 18, 2019 07:31 PM PDT – Page Load: 0.2207 Sec.